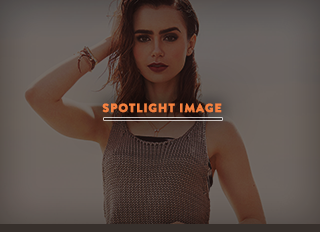 Lily recently did an interview and photoshoot for Just Jared’s Spotlight of the Week! I’ve added 5 photos from her shoot. Check out the beautiful photos Lily did and her interview below! Lily Collins looks super fierce in a Thakoon dress in this exclusive photo for Just Jared’s Spotlight of the Week, shot by photographer Justin Campbell! The 24-year-old actress stars in new film The Mortal Instruments: City of Bones, in theaters everywhere right now. She plays Clary Fray, a girl who learns that she descends from a line of half-angel warriors called Shadowhunters who protect the world from demons. She must join forces with them and descend into a dangerous alternate New York called Downworld. Lily chatted with us about one of the craziest stunts she had to film for the flick. “I had to climb up this fire escape and launch myself off of it, after the vampire lets go of my foot, and I did it in my six inch boots and my mini dress, so I was trying not to show any skin while launching myself onto Jamie [Campbell Bower], which was interesting,” she said. JJ: Any injuries on set at all? LC: Tons of bruising. Never really any full injuries except for lots of bruising. JJ: What’s your favorite off screen moment? LC: There was a moment at which we’re on the rooftop in the vampire scene, when the vampires fight, and we burst out of this door and we’re in serious fight mode. But two seconds before they yelled action, we were in the dark, like literally peeing our pants laughing because we were making fun of each other and doing voices. And then they yelled “Action” and we didn’t hear it, and we had to burst out the doors. JJ: Describe your costars in one word. Godfrey [Gao]. JJ: What is your favorite memory from this past summer so far? LC: Oh my gosh, um… Genuinely, this mall tour has been so amazing. But I think actually playing a mom. I was just in Dublin for two and a half months filming Love, Rosie and I got to be a mom to this lovely young actress, Lily Laight, was Lily as well. But I think playing, getting the experience to play a mom was amazing. JJ: What’s next for you after Mortals? LC: Oh God, well we’re shooting the sequel. I don’t really know what’s next after this for sure. I’m signed on for Pride & Prejudice & Zombies, but I don’t know when that’s going to go, so right now it’s just focused on the sequel up until Christmas, because my next break is Christmas.